With its diverse mix of cities, immaculate beaches, paddy fields and rugged mountain ranges, it’s scarcely surprising that Vietnam’s popularity has been growing in recent years. Located in Southeast Asia, this small yet abundant country is packed full of spectacular sights and unique experiences. Our luxury resorts in Vietnam offer the ideal base to explore this eclectic country. Ho Chi Minh, located in the south, is the country’s largest city. Situated on the banks of the Saigon River, its wealth of fine restaurants, superb shopping facilities and lively bars never fails to impress. You’ll also find some of the best 5 star Vietnam hotels here, from which you can tour the city’s many attractions, including the War Remnants Museum, the spectacular Jade Emperor Pagoda temple and tranquil botanical gardens. Located in the north is Hanoi, the capital city, which retains a notably more traditional air with its colonial architecture and old-worldly charm. Be sure to visit the nearby Perfume Pagoda set among rolling limestone hills, and the spiralling citadel of Co Loa before enjoying a performance of the delightful Vietnamese water-puppets. One of Vietnam’s most alluring landmarks is Ha Long Bay on the north coast, where you’ll be amazed by the sight of hundreds of jagged limestone outcrops jutting majestically from the sea. Take the time to explore the mysterious caves around Dong Hoi and visit the enchanting Cat Ba Island, with its profusion of coral reefs, mangrove plantations and evergreen forests. Another must-see historical site is the Cu Chi Tunnels, created by the Viet Cong for refuge during the American War. 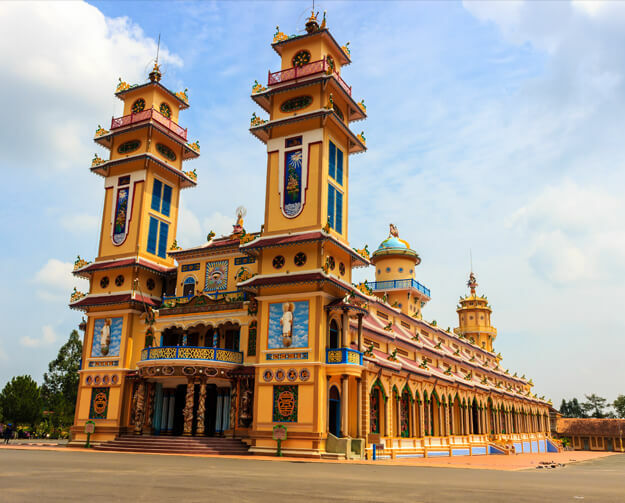 Step back in time as you crawl through the winding underground maze before heading to the nearby technicoloured façade of the Cao Dai Great Temple of the Holy See. The My Son Hindu Sanctuary, with its crumbling temples and remains of the ancient Champa civilisation, is also not to be missed. The glorious white sands and cerulean waters along the southern coast are a popular attraction for many who visit Vietnam. Nha Trang is one of the busiest resorts with its profusion of restaurants, cafés and bars. There are ample opportunities for scuba diving, snorkelling and kayaking here, while other activities include the Vinpearl Amusement Park and Thap Ba Hot Springs. The quieter Mui Ne boasts gorgeous stretches of pristine beach and rolling red and white sand dunes. From here, you can also travel to the fascinating Po Shanu Cham Towers and Van Thuy Tu Temple. The Mekong Delta in the Southwest comprises miles of paddy fields, rich orchards and sugar cane groves. Give yourself time to visit one of the small villages scattered across the region where, away from the bustle of the cities, you can catch a glimpse of true Vietnamese culture. If you’re feeling adventurous, the north offers a marvellous wilderness of mountains and dense forests just waiting to be explored. Our luxury holidays in Vietnam can be tailor-made to suit your needs, whether you’re looking for an action-packed experience or something more relaxing. Why not get in touch with our team by phone or live chat to find out more? 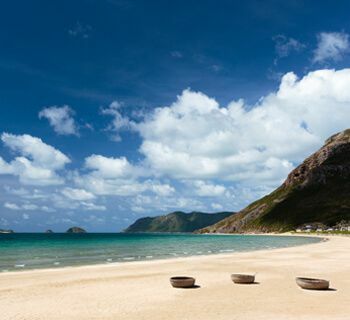 Six Senses Con Dao is set in a stunning area of Vietnam’s archipelago islands. It is wonderfully remote, although less than an hour’s flight from Ho Chi Min City. The design is contemporary and elegant, while also feeling very Vietnamese. 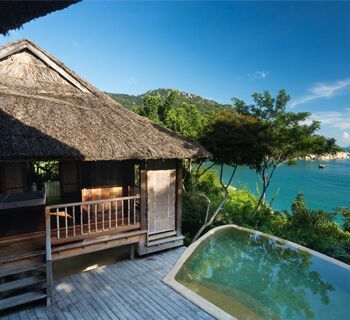 Six Senses Ninh Van Bay has spectacular views over the East Vietnam Sea and the mountains beyond. A 60-minute road transfer from Cam Ranh International airport will take you to the resort’s lounge, from where a boat will collect you for a beautiful, short journey across the bay to the resort itself.